Voyager, the Pioneer anomaly, and NASA’s good old days. The modest, mighty Voyager and Pioneer probes are still generating news today. An artist’s rendition of the Pioneer 10 spacecraft as it passes Jupiter. The speed of light is inconceivably fast. It is just shy of 300,000 kilometers per second. That is, for everyday purposes, instantaneous. A signal from the space probe Voyager 1, which is investigating the limits of the sun’s influence in the galaxy, takes just over 17 hours to arrive at Earth. Voyager 1 is almost 125 times as far from the sun as Earth is, so the signal is very weak when it arrives. The tenuous radio waves are gathered by antennas of NASA’s Deep Space Network, in the Mojave Desert, outside of Madrid, and in Australia. Despite shaky launches in 1977, both Voyager 1 and its sibling Voyager 2 have lasted more than 35 years in deep space. They were originally meant to visit only Jupiter and Saturn. Voyager 2 made it onward to Uranus and Neptune, and Voyager 1 is now probing the outer reaches of the solar system and might be on the verge of leaving entirely. (Voyager 2 is also still functioning, but is moving more slowly and now lags behind.) Departure is a complicated matter, though: As the Voyager team reported in late June in Science magazine, the solar system’s boundary is more muddled than astrophysicists had previously suspected. The Voyagers are often described as pioneers, blazing a trail through the outer solar system. This isn’t entirely true. The first space probes to visit Jupiter and Saturn were called, well, Pioneers. Pioneer 10 and Pioneer 11, to be precise. Both missions were born in the time of Apollo. Voyager 2’s encounters with Uranus in 1986 and Neptune in 1989 were just about NASA’s only successes in the 1980s. It was a bleak decade for NASA, when the failures of the space shuttle loomed large, casting a shadow that has yet to lift. The institutional tension in NASA is often described in terms of the manned vs. unmanned programs. Though the budget fights were, and are, real enough, the true tension in NASA is between exploration—sending spacecraft to places they have never been before, whether or not with a person onboard—and the sort of aimless technological bloat typified by the space shuttle. The fact that NASA has done the second badly should not obscure the fact that it’s done the first very well. Last summer’s dramatic and successful landing of the rover Curiosity on Mars shows that spirit of exploration at NASA persists even amid a broader drift at the agency. At its best, NASA’s exploration is both tangible—it sends objects out to sample distant, forbidding environments—and relevant—the faraway facts illuminate terrestrial truths, spiritual and scientific. The spotlight was on the Voyager and Pioneer missions at the time of their planetary encounters. That is, after all, the reason they were built. But just as Voyager 1’s dispatches from the solar system’s boundary in June showed its residual scientific value, the Pioneers also had more science left to do after passing Jupiter and Saturn. In fact, what they found in the void of the outer solar system had potentially a greater scientific impact than anything they had found at the planets. Over the next dozen years, hundreds of physicists would work on what came to be called the “Pioneer anomaly,” some wondering whether it might allow them to explain away dark matter or dark energy. Even though the Voyagers were bigger and more sophisticated, the physicists focused on the Pioneers because of a technical coincidence. The older craft were stabilized in a simpler way: by spinning. This meant that the Pioneers were much more precisely navigated—a force the size of the Pioneer anomaly was not detectable on the Voyagers. The main design argument against spinning is that it makes it hard to take pictures. The nonrotating Voyagers had cameras that took vivid photos of the planets and their moons. The simpler Pioneers could store only five commands in memory, and had to be constantly commanded from Earth, while the Voyagers were programmable and so could adapt to their longer mission. 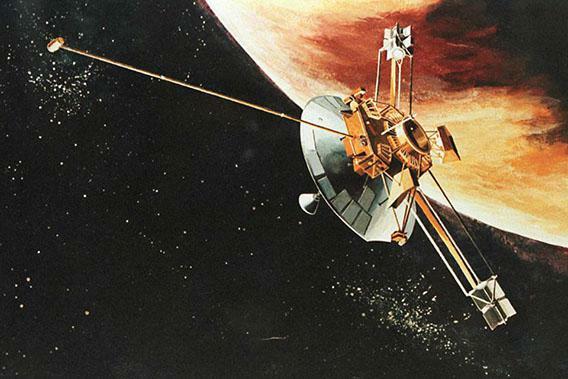 This difference was, in part because the Voyagers cost three times as much, and, in part, because computer technology was evolving rapidly in the years between the two missions. JPL was already a year into designing the Voyagers, but the laboratory had to go back to the drawing board to protect the probes from radiation. Edward Stone, Voyager’s chief scientist, says they had to completely redesign both the electronics and the optics. The radiation hardening contributed, he says, to the Voyagers’ longevity. That quiet planning included the interstellar mission from the start, says Suzanne Dodd, who currently holds Casani’s old job running Voyager. Neither Voyager would have survived its Jupiter encounter if not for Pioneer 10’s scouting mission. In turn, Voyager 1 was able to figure out one reason there was so much radiation around Jupiter—Io, one of Jupiter’s moons, has volcanoes that spew tons of sulfur into space every second, which, through a complex series of interactions, exacerbates the radiation around Jupiter. This is a mission that is going to be in the history books 500 years from now, but it won’t be in the history books because we learned what the harmonics of the gravitational potential field of Neptune were. Nobody’s going to care about that. The reader is not going to care, you don’t care, even I don’t really care. Why is it going to be in the books? Because it was a great adventure of the human race. All these spacecraft were the product of paradox. They were made by thousands of people working together and operated over decades by thousands more. Their reliable functioning rested not on genius but on bureaucratic organization. Neither project exceeded its budget with cost overruns or with delays. But the diligence to see the projects through, to make science out of weak radio signals right on up to the edge of the solar system, required passion, and genius also. The Pioneers and Voyagers are lessons in how bureaucracy—a much maligned word—can channel the passion of individuals to accomplish wonderful things. As NASA enters the next phase of its existence, it would do well to remember the successes of these early space probes. This article arises from Future Tense, a collaboration among Arizona State University, the New America Foundation, and Slate. Future Tense explores the ways emerging technologies affect society, policy, and culture.